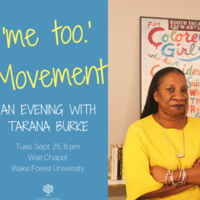 #Metoo is not just an overnight hashtag sensation; Tarana has dedicated more than 25 years of her life to social justice and to laying the groundwork for a movement that was initially created to help young women of color who survived sexual abuse and assault. The movement now inspires solidarity, amplifies the voices thousands of victims of sexual abuse, and puts the focus back on survivors. In her upcoming book, Where the Light Enters, Tarana discusses the importance of the #metoo movement as well as her personal journey from "victim to survivor to thriver."